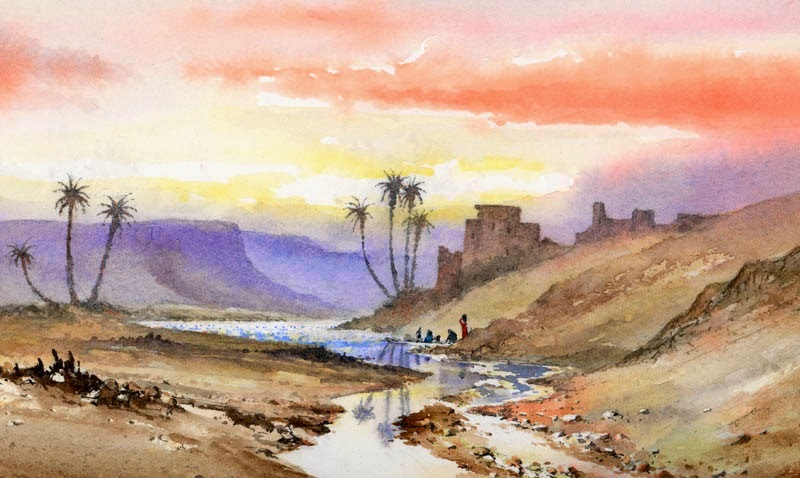 This entry was posted in aerial recession in landscape paintings, atmosphere, David Bellamy, Tranquil scenes in watercolour, Watercolor mountains landscapes, watercolour by David Bellamy. Bookmark the permalink. I love this striking scene David, more of your magic ! Thank you David for posting this and for the tips for capturing a more tropical landscape. Can I ask what you mixed for the dark colour of the palm trees, we get lots of wonderful sunsets here and early evening skies that silhouette the palms here where I live. I have just bought some Daniel Smith’s neutral tint, do you use a neutral tint mixed with another colour? Paula, this was painted some time ago and I can’t remember exactly which colours I used. It was most likely French ultramarine mixed with light red for both trunk and palm fronds, with some gamboge added to the fronds while they were still wet, and allowing it to seep down into the top of the trunk. I don’t use neutral tint, and haven’t tried the Daniel Smith version, although I’m aware their colours are excellent and I enjoy using them. Please note that my current blog post covers painting the effects of intense heat which you were interested in.